McCormick Care Group’s strategic plan for 2016 to 2019 reaffirms the organization’s commitment to be recognized as one of Canada’s leaders in innovative dementia care by 2022 through robust staff development and a strategic research plan. The McCormick Care Group is committed to advancing dementia care through the programs and services delivered at McCormick Home, a long-term care home; McCormick Dementia Services, an adult day program that is committed to enhancing quality of life for people with dementia and their caregivers; and McCormick Dementia Research, its research program. 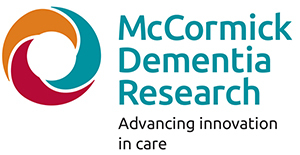 McCormick Dementia Research seeks to provide leadership in advancing dementia care through research partnerships and collaborations. The purpose of this research plan is to provide direction, to focus efforts on achieving the strategic research goals and initiatives identified, and to progress from funding and participating in research projects to implementing evidenced-informed care. We create a caring community in which our clients, residents, family members, and caregivers – especially those challenged by dementia – feel a sense of safety, belonging, and purpose. We champion care that enables people with dementia to lead meaningful lives. We strategically invest in innovative programs, staff development, knowledge sharing, best-practice applications, and research projects that focus on improving care. Compassion – We listen to understand the hopes and needs of those we serve, and do our best to respond. We treat each other with kindness and dignity. Accountability – We earn the trust of those we serve, our teams and our partners by honouring our commitments. We carefully and responsibly manage our resources. Respect – We value diverse cultures and perspectives. We communicate honestly and politely. We nurture relationships with our clients, residents, and families, and advocate passionately on their behalf. Excellence – We bring our best to work every day and lead by example. We use current research evidence and best practice guidelines to continuously improve the care we provide. We celebrate our successes. Collaboration – We strengthen our teams, learn from each other, and contribute to enhancing the health care system through respectful cooperation, knowledge sharing, and mutually beneficial partnerships.